In 1991 a publisher’s rep approached me about writing a book. Dreams of seeing my work in print danced before my eyes. I barely invested in negotiating a deal, so eager was I to write. Soon the process of writing consumed my Sundays. For the better part of a year I did all my grading and lesson planning at night and on Saturdays. Without fail I’d rise in time to be at my Macintosh Classic, a mug of coffee by my side. From 8 am to 8 pm, with time out for lunch and dinner, I labored over my draft. I had to snail mail sections to my editor and discuss revisions with her on labored, expensive long-distance phone calls. Already away at college, my sons didn’t suffer my regular Sunday abandonment. My sweet husband remained unfailingly patient. 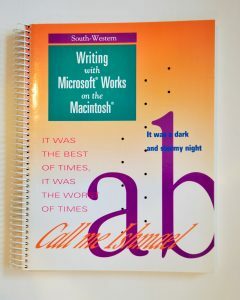 My textbook for high school writing classes focused on the relatively new use of computers to teach writing, incorporating unfamiliar skills where they fit in the writing process. Using floppy disks, saving work, understanding simple features such as word wrap – skills we take for granted now [some of them outdated] challenged the computer novice then. Each chapter taught specific computer skills and then required their use for specific writing tasks. Cutting and pasting, for example, starts the chapter on revising. 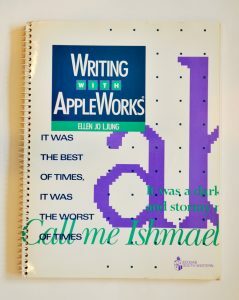 I included the components of a comprehensive writing program, including essays, journal entries, letters, creative writing, grammar, and sentence variety. One day my editor said, “We really have our work cut out for us, don’t we?” Incensed, I missed her point – that we would struggle to meet the company’s deadline. I thought she was putting down my writing. She was, of course, correct about the pressure of the deadline, but I was too busy ranting about her attitude to register her point until much later in the call. I still managed to finish a piece that made me proud, and I kept my grumbling to myself when called upon to develop a floppy disk of accompanying exercises. When the book came out, its cover a true work of art in my eyes, I floated for weeks. And I didn’t learn. When Microsoft Works came out, the company tasked me with creating a second version tailored to that program. My euphoria began to evaporate when my meager royalty checks failed to cover my investment in software, paper, ink, and postage. Unfortunately publishers who targeted high school English departments failed to see the market opportunity, so I’d gone with a secondary school business publisher. Despite their best efforts, English departments remained unaware, and boxes of both books sat on the shelves of warehouses. They turned down my suggestion that they donate the books to schools in underprivileged communities, taking a tax write-off and sending me no royalty for donations. When a bigger publisher bought mine and a few more unfruitful years went by, the warehouse books were destroyed. Heartbroken, I pondered why I’d sacrificed so much for so little return. Sure, I’d hoped for some royalties to help cover college costs. Mostly, though, I’d reveled in seeing my work in book form, a significant step up from all the professional writing I’d done in journals. Was it enough? In time I realized that the process of writing these books forced me to clarify my own beliefs about the teaching of writing. Finally I had my own overview of what worked and what mattered. As computers offered more and more innovations, I embraced them and added what I was learning to that framework. I had gained more than vanity here. And now I’m at it again. For years I’ve wanted to write my teaching memoir, to tell the stories I’ve told to trapped guests at dinner parties! My title would be My Mother Professor Never Told Me There’d Be Days Like This. I began again. Initially I tried a chronological approach. No detail was too small to entrap my readers. Fortunately my writing group pushed me to clarify my purpose and audience. Did I just want to leave a complete – too complete – record for family who would probably never plow through it? Or was there a point to these stories, a bigger reason to share them? Indeed, I realized that my favorite stories had one factor in common: as the teacher I had often been the one to learn an important lesson from a student, or a group of students, or a colleague, or a parent. My lessons learned became my focus. That alone would make this endeavor worth the time and effort. To my surprise, however, I gained another bonus. Reaching out to former students and colleagues has renewed relationships. I’m growing old, and I no longer have the patience to fight to get a publisher again. I’m not willing to risk the time wasted or that the chance of another poor fit. But I am blessed with this brave new world of self-publishing. When I finish my manuscript, that’s my path. I already have a title and a vision for the cover. At that point I hope that at least some of those former students and colleagues read some of it. I plan to give it to my children and grandchildren and to voice my wish that they read at least some of it. But none of that matters as much as I used to believe. For the real reason for me to write this book is to know myself, to understand the decades I spent in the classroom and how they changed me, and to celebrate those decades with a kind of closure that’s meaningful to me. So now that’s why I’m writing this book. I can’t wait to finish, to see it in print, to get some feedback from those readers listed above. But the more I write, the more I think of that I want to include, so publication keeps moving further and further forward! That’s okay with me – right now it’s the process that counts most.